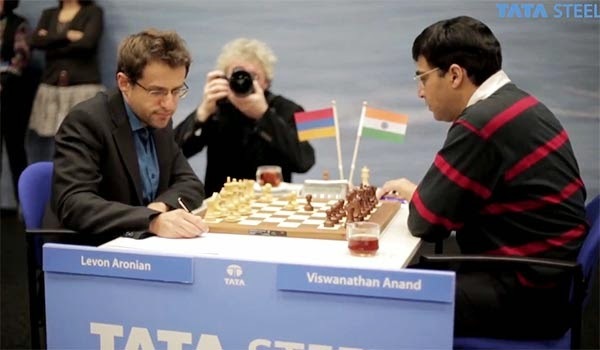 The Isolated Queen Pawn's Blog: Game of the year 2013 - Anand's Brilliancy !! It was given the award as 2013's Best Game. Some also refer to it as Anand's Immortal / Anand's Brilliancy as in today's day when Chess is supposedly becoming an equal drawish game, with rise of chess engines and other computer software, the Black side crushes the enemy's defense and just gets on tactics, and more tactics and finally gets a full point within 23 moves !! With White's last move 6. Bd3, here black has a good opportunity to develop at the cost of this move. 6...dxc4 7. Bxc4 b5 Prepares for a Bb7 and this is exactly what happened in the game. So Black completely ignores the threat on h7 and goes for what he had planned. Look at the position after just 13 moves and how black can attack in many ways. The only move that stops this attack is f4, and white does play it, in turn weakening his d4-e3-f2 diagonal and black has the right tool to attack here. 14. f4 cxd4 exd4 15. Bc5!! Because if 15. dxc5 then Nxc5 followed by Qd4+ or taking the bishop on d3 if not defended for the second time. 16. Be2 Ne5!! Leaving everything under attack. Variations shown in the entire game play below. The Bishop on c5, Kinght on e5, Rook on f8, pawn on b5 all hanging !! Guess what happens next ! We are just 16 moves into the game, we got a result just after 23 moves, which means, 7 strong moves only. Guess the result anybody ?? View the game below to know more variations and how the game ended. Comments from Anand, "I think if I have my worst score with anyone it;s him (on Aronian)"
For more articles about Anand, read my earlier blogpost on this staggering win in the Candidates tournament at Khanty Mansiysk 2014, Eye of the Madras Tiger! Comments from Levon Aronian, "The Bishop on b7 was monstrous"
Follow my blog for more such posts, puzzles, games.